These pages contain one sentence descriptions of the various tools examined during the course of the project. Beside each description there is a visual representation relating the content of the tool to key dimensions. The aim of these spidergrams is to offer a visual profile of each instrument, e.g. for a quick initial comparison of different resources. The spidergram values are to be read from the centre of the visualisation. Clicking on ‘view details’ enables the user to read more details about the purpose and contents of the tool, its origins and so on. There are two ways of searching for relevant tools: you can use the matrix of topics/dimensions on the right to click on a specific area of interest, or/and you can narrow down your search using the filters listed below. In the lower part of the main page a link can be found to brief descriptions of some important frameworks describing learner competences as well as various key Council of Europe and other background documents relevant to the issue of teacher competences. Last but not least, there are links to more detailed descriptions of the piloting and further development of a few existing resources in the context of this project. 40 items found for "Show all items"
The Eaquals Framework is a compendium of descriptors of the knowledge and skills needed by language teachers, covering aspects of planning, teaching, assessment competences, language, culture and professionalism. Focus / content The Eaquals Framework is a compendium of descriptors of the knowledge and skills needed by language teachers, covering aspects of planning, teaching, assessment competences, language, culture and professionalism. Objective / structure Framework of descriptors of knowledge and skills designed for the purposes of self-assessment and ongoing professional development. It is organized over three successive ‘phases of development’. Further information and comments The Framework is context-independent (any type of institution & additional language). It is a more analytical alternative to the EPG with considerably more detailed sets of descriptors but organized over three main phases of development (instead of six). EPOSTL is a portfolio for the self-assessment of didactic competences of student foreign language teachers. Focus / content EPOSTL is a portfolio for the self-assessment of didactic competences of student foreign language teachers. Objective / structure EPOSTL is a self-reflection tool containing ‘can-do’ descriptors of didactic competences. These consist essentially of didactic skills related to the development of language skills (speaking, writing, listening, reading, vocabulary, grammar etc. ), the assessment of language proficiency, classroom management etc., as well as competences related to values (intercultural awareness etc. ); knowledge - of national curriculum etc. ; educational aspects – fostering learner autonomy etc. The main part is complemented by further opportunities for reflection, including questions to the user and a dossier. Further reading Newby, D. (ed.) 2012. Insights into the European Portfolio for student teachers of languages. Newcastle upon Tyne: Cambridge Scholars Publishing. A framework for evaluating and enhancing the quality of initial teacher education courses for language teachers in Europe that focuses on knowledge and understanding (8 areas), strategies and skills (13 areas) and values (6 areas). Objective / structure A frame of reference for teacher education courses in universities and teachers’ colleges which links up knowledge & understanding, strategies & skills and values to course structure and the learning experiences offered to student teachers. Institution / authorship Michael Kelly and Michael Grenfell (University of Southampton) - Report written with Rebecca Allan, Christine Kriza and William McEvoy (University of Southampton). Case studies contributed by 11 institutions across Europe. -	thought provoking way of linking up the learning experiences of (student) teachers on such courses and the ways in which these experiences can contribute to the development of competences and values. The EPG is a competence framework covering the main language teaching competences, enabling competencies (language proficiency, intercultural competence and language awareness), and professionalism. Further information and comments Also available in an electronic version that allows the development of online profiles. Primarily aimed at enabling teachers to assess themselves against validated descriptors. Managers or trainers can work with individual teachers and teams to produce competence ‘profiles’ and support the further development of the competences which are agreed as most important. The Framework is provided as a tool to enable teachers of English to assess and plan their own professional development, and relate this to Cambridge English’s qualifications for teachers of English and for English language. Focus / content The Framework is provided as a tool to enable teachers of English to assess and plan their own professional development, and relate this to Cambridge English’s qualifications for teachers of English and for English language. Each of these is divided into sub-areas providing brief general descriptors for 3 successive levels of competence: ‘beginning’, ‘competent’ and ‘advanced’. Further information and comments The Framework is linked to a ‘needs assessment’ instrument organised in a series of self-assessment ‘can-do’ questions for each competence area. Objective / structure The Framework is divided into 4 main ‘domains’: planning and preparation (subdivided in 6 component areas), the classroom environment (5 components), instruction (5 components), and ‘professional responsibilities’ (6 components). Each component contains a brief description, a list of ‘elements’ and a list of indicators. The evaluation checklists for each component (22 in total) contain ‘critical attributes’ and ‘possible examples’ of teacher behaviours for 4 levels of teacher competence from ‘unsatisfactory’, ‘basic’, satisfactory’ and ‘distinguished’. Further information and comments The Framework was originally published in 1995 and has been updated most recently in 2013. It claims to be based on extensive research and is primarily aimed at authorities in US state responsible for evaluating teachers working in public schools from kindergarten to grade 12. Objective / structure This core curriculum is applicable for teacher education across the state. It has a transversal dimension, ‘accepting diversity as a challenge and an opportunity’, with 5 other competence areas: teaching heterogeneous classes, taking account of the educational task during teaching, stimulating, documenting & assessing learning and achievement, advising pupils and parents, and taking a cooperative developmental approach to the system and the school. For each main area there are ‘operative situations’ (examples of activities), key developmental questions, and content guidelines. These are followed by a list of competences expressed as standards. Further information and comments For each main area there are ‘operative situations’ (examples of professional tasks), key developmental questions, and content guidelines. These are followed by a list of overlapping competences expressed as standards. The framework spans 12 professional practices relevant to all teachers, offering a way of conceptualizing professional development as an incremental process. Focus / content The framework spans 12 ‘professional practices’ relevant to all teachers, offering a way of conceptualizing professional development as an incremental process. Objective / structure To provide a framework that enables teachers (of all subjects) to plan their CPD. The ‘professional practices’ are: planning lessons and courses, understanding learners, managing the lesson, knowing the subject, managing resources, assessing learning, integrating ICT, taking responsibility for professional development, using inclusive practices, using multilingual approaches, promoting 21st-century skills, and understanding educational policies and practice. They are organized in a wheel of concentric circles. The concept is that, for each professional practice, the teacher develops through four successive stages, awareness > understanding > engagement > integration, gradually moving towards the ability to deliver high quality teaching. The framework describes the teacher competences and resources for the teaching of two foreign languages (French and English) in obligatory school (primary and lower secondary). Focus / content The framework describes the teacher competences and resources for foreign language teaching in obligatory schooling (primary and lower secondary). Objective / structure The resource is a competence framework for foreign language teachers in obligatory schooling. It was designed for teaching of French as a first foreign language (starting at 9 years) and English as a second foreign language (starting at 11 years). The catalogue’s aim is to coordinate teacher education to prepare primary and lower secondary teachers for a number of curricular aims, including the introduction of two foreign languages in primary school, a common methodology for French and English, and curricular coherence on different levels for a variety of plurilingual and intercultural aims. The framework emphasises and displays the coherence between the student teacher’s own learning biography, and the corresponding competences and resources directed towards their learners. The framework is an example for how a national/regional adaptation of key European instruments is explicitly derived from key European reference documents, including the CEFR, CARAP/REPA, EPOSTL, and the European Profile for Language Teacher Education. A main focus of the instrument is to create horizontal coherence in the curriculum through harmonizing the educational pathways of teachers of the first and second foreign language. Examples of use in practice The framework has been used as a planning reference for teacher education curricula in parts of German-speaking Switzerland. A common and coherent framework of reference describing the professional competences of teachers of Spanish as a second or foreign language in Cervantes Institutes all over the world, for the professional training / development of the teaching staff. Focus / content A common and coherent framework of reference describing the professional competences of teachers of Spanish as a second or foreign language in Cervantes Institutes all over the world, for the professional training / development of the teaching staff. Objective / format Providing quality education for the Cervantes Institutes through professional training of its teaching staff. 5 common competences for teacher of other disciplines. Each key competence includes 4 specific competences or sub-competences. Target group Teachers of Spanish as a Second or Foreign Language in Cervantes Institutes. Teachers of other disciplines. The document is clear in its objectives and user-friendly, the descriptors are accompanied by explanations and examples of application. the intercultural competences of the learner and the teacher are mentioned in several parts, however the plurilingual dimension is not taken into account. The framework contains language-related teacher competences for initial education in Scotland. Focus / content The framework contains language-related teacher competences for initial education in Scotland. Objective / structure The National Framework for Languages (NFfL) aims to support all students and teachers throughout initial teacher education (ITE) and career-long professional learning (CLPL) to develop an understanding of the role of languages in and for education. The framework is built on three pillars: Professional Values & Personal Commitment; Professional Knowledge and Understanding; Professional Skills and Abilities. These pillars are overarched by a set of principles and context: Plurilingualism, Diversity, Policy & Legislation, and Transformative practices. Target group Teacher educators designing programmes for initial teacher education, student teachers, teachers. • The LENS (Languages Education Network Scotland) is a resource bank of studies and research findings from (inter)national contexts, organized according to themes relating to language teaching and learning. • The LEAP (Languages Education Academic Portfolio) is a reflective tool to support the implementation of the framework. It combines aspects of two earlier ECML publications, EPOSTL and PEPELINO. The TELL framework describes the behavior of foreign language teachers, in obligatory schooling and beyond. Focus / content The TELL framework describes the behavior of foreign language teachers, in obligatory schooling and beyond. Objective / structure The framework contains descriptors of teacher behaviour (performance) in seven areas. The two areas Planning and Environment are subsumed under the heading ‘Preparing for student learning’. Three areas belong to ‘Advancing student learning’: The Learning Experience, Performance & Feedback, and Learning Tools. Finally, the areas Collaboration and Professionalism are assigned to Supporting Student Learning. Unlike many other frameworks, the descriptors focus on the teachers’ observable behaviour (e.g. their actions) rather than the competences, including (occasionally) the behaviour of the target language learners (e.g. in the classroom). The website also contains a number of additional documents, including forms for self-assessment, feedback to teachers, further reading, and correlations to other frameworks. An official set of standards covering 9 areas of competence including knowledge of students, the language, the culture, language acquisition, the learning environment, curriculum and planning, assessment, reflection and professionalism, which are designed to guide teachers working in the US national school education system. Focus / content An official set of standards covering 9 areas of competence including knowledge of students, the language, the culture, language acquisition, the learning environment, curriculum and planning, assessment, reflection and professionalism, which are designed to guide teachers working in the US national school education system. Alfarådet, the Nordic Adult Literacy Network (2013) Description of Teachers’ Competence in initial and functional literacy for adults with non-Nordic mother tongues. This framework describes the competence of a professional teacher of initial and functional literacy (reading and writing as social practices) to adults whose mother tongue is not a Nordic language. Focus / content This framework describes the competence of a professional teacher of initial and functional literacy (reading and writing as social practices) to adults whose mother tongue is not a Nordic language. Objective / structure Focus on literacy, languages across the curriculum, teaching methodology, language acquisition, learning psychology and sociology, teachers’ development and professionalism, reflection and self-assessment by the teacher, capitalising on linguistic and (socio)cultural resources of the learner, attention to learners’ individual needs, education for democratic values, social inclusion. The framework is divided in six competence areas which are concretized by several descriptors organised in two categories: knowledge; and skills and actions. Authors from several institutions: Norwegian Agency for Lifelong Learning; Ministry of Children and Education, Danemark; VoksenUddannelsescenter Fredriksberg, Danemark; Institute for Swedish as a Second Language, University of Gothenburg; National Centre for Swedish as a Second Language, University of Stockholm; National Board of Education, Finland; University of Iceland, Reykjavik; University of the Faroe Islands. Each descriptor is linked to specific parts of the curriculum. The formulation is clear and understandable. The instrument can serve as a tool for reflection and includes descriptors for teacher education programs and research. A competence framework for foreign language teachers in primary school to accompany a four-week course/placement. Focus / content A competence framework for foreign language teachers in primary school to accompany a four-week course/placement. Objective / structure To promote target setting, self-assessment and formative assessment during the placement of primary teachers on 4-week exchange courses. 4 areas of competence are dealt with: professional values, pedagogy and practice, linguistic competence, and intercultural understanding. These are set in three progressive stages: observation, implementation and evaluation in a spiral format indicating steps that involve review and reflection. Target group Organisers of exchange courses for foreign language teachers Foreign language teachers participating in exchange courses . Further information and comments • A simple but innovative example of a competence framework that is restricted to a specific context. • The use of the spirals covering the 4 areas of competence progressively through observation, implementation and evaluation is innovative and insightful. • The link between these spirals and the lists of competences in the appendices enables the Framework to be used as a source for course design. The portfolio is a self-assessment tool for language teachers’ target language and intercultural competences. Focus / content The portfolio is a self-assessment tool for language teachers’ target language and intercultural competences. Objective / format Based on the Common European Framework of Reference (CEFR) and the European Language Portfolio (ELP), the Canadian Language Portfolio for Teachers is an instrument for foreign language teachers’ self-assessment of their (target) language and intercultural competences, as well as strategies for language use and language learning. Like the ELP, the portfolio contains a ‘passport’ and an ‘autobiography’ section for an overview of the owner’s linguistic biography, detailed checklists for the auto-evaluation of different competences, and a dossier to file further documents. Unlike most related instruments, the Canadian portfolio allows users to self-assess linguistic aspects of their competences, such as their range of vocabulary or the grammatical accuracy of their speech and writing. For language competences, the portfolio reproduces generic language competence descriptors from the CEFR at different levels, and then complements them with a task-specific descriptor that is related to language teaching. For level C1 and above, these descriptors typically describe activities in (continuing) education rather than classroom language. Examples of use in practice For this instrument, the project team has collected one or more examples of use in practice. Further information and comments Attractive design and very flexible adaptation of the descriptors to the diverse working environments of trainers. However, intended for use only by trainers providing training in workplaces. The appendix contains useful self-assessment forms and maps. The documents provide a description of competences needed by teachers of EAP, especially those working in the UK, as well as a scheme for enabling such teachers to gain a specialized qualification in EAP. Focus / content The documents provide a description of competences needed by teachers of EAP, especially those working in the UK, as well as a scheme for enabling such teachers to gain a specialized qualification in EAP. It provides summary statements for each area and detailed descriptors divided between ‘knowledge’ and ‘ability’, accompanied by indicators, i.e. means of identifying the competences described. Further information and comments A specialized but limited scheme that has been carefully thought through and is designed to enable teachers of English to develop their competences in EAP. The ICCinTE focuses on the development of intercultural communicative competence in teacher training and development. Focus / content Training teacher educators to incorporate the theory and practice of intercultural communication and to develop teaching materials that promote intercultural learning. Assessing ICC (Conceptual framework, Assessing the 3 dimensions of ICC (Knowledge, Attitudes, Skills), Methods, Steps, Levels of performance for final assessment. a valuable attempt to define levels of ICC for curricula and assessment, both in teacher education/development and for the target learners. The European Framework for CLIL Teacher Education is focused on the competences necessary to teach content subjects and an additional language in an integrated manner. Focus / content The European Framework for CLIL Teacher Education is focused on the competences necessary to teach content subjects and an additional language in an integrated manner. Objective / structure This macro-framework identifies the target professional competences: CLIL fundamentals, content and language awareness, methodology and assessment, classroom management, learning resources and environments, research and evaluation. It is divided into eight thematic domains which are concretized by several descriptors. Each descriptor is linked to parts of professional development modules. This framework gives a global overview about CLIL-teacher competences and can be adapted to different contexts. The instrument can serve as a tool for reflection and includes descriptors for research (action research and evaluation). This is a general guide to teaching CLIL, covering areas such as: learning language in content instruction, vocabulary learning and teaching, the role of grammar, teaching language skills, thinking skills, learning strategies, task-based instruction, and assessment in CLIL. Focus / content This is a general guide to teaching CLIL, covering areas such as: learning language in content instruction, vocabulary learning and teaching, the role of grammar, teaching language skills, thinking skills, learning strategies, task-based instruction, and assessment in CLIL. Objective / structure A teacher’s handbook (rather than a framework) that offers practical support for language teachers involved in the teaching of other subjects. Further information and comments The Handbook does not list learner competences but offers guidance to teachers on how to develop these competences, including suggested learning activities and resources. A DVD containing support materials and videos of teaching was produced as part of the project. Focus / content An aid for personal reflection by teachers of all subjects about the language demands implicit in the different subjects and the extent to which these are taken into account in their teaching. Further information and comments The six lists of descriptors, expressed as first person behaviours, include many examples of language use and references to the language competences related to subject teaching that invite teachers to reflect on the ways in which they help learners to develop the language-related competences they need. A tool for personal reflection on professional competences for students who are embarking on initial training to become pre-primary educators, focusing on the plurilingual and intercultural dimension of work with pre-primary children. Focus / content A tool for personal reflection on professional competences for students who are embarking on initial training to become pre-primary educators, focusing on the plurilingual and intercultural dimension of work with pre-primary children. Objective / structure This is a portfolio for individual reflection about professional development and competences for people working with or preparing to work with pre-primary children. Further information and comments This Portfolio encourages reflection on the degree to which language-related and intercultural teaching competences are being acquired. It promotes reflection as a key means of furthering one’s own professional learning. The framework describes the language competences needed for foreign language teaching. Focus / content The framework describes the language competences needed for foreign language teaching. 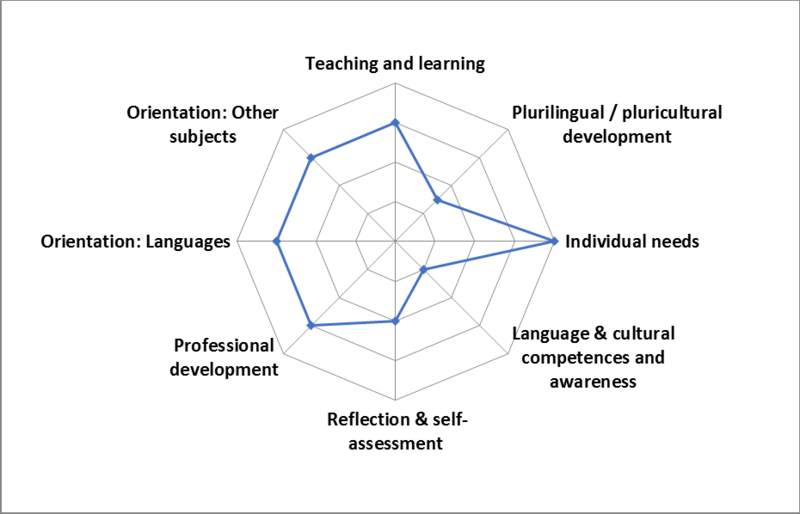 Objective / structure The Profiles contain profession-related target language competences of foreign language teachers in five domains: preparation, teaching, feedback and assessment, extracurricular learning (e.g. mobility and exchange projects), and teacher education / development. It exists in two largely overlapping versions for foreign language teaching at primary and secondary level. The resource has a clear focus on language competences, and lends itself for combination with other instruments, e.g. frameworks for didactic competences. The instrument describes teacher competences for bilingual education, distinguishing between different teacher roles (language vs. subject teachers). Focus / content The instrument describes teacher competences for bilingual education, distinguishing between different teacher roles (language vs. subject teachers). Objective / structure The competence framework was written in the context of French-Polish bilingual schools in Poland. It distinguishes between common competences for all teachers, and specific competences for French as a subject, and non-linguistic subjects taught in French. It uses a distinction betweeen teacher’s savoirs, savoir-faire, and savoir-être that correspond to different missions, such as classroom teaching, cooperation with stakeholders, and the teacher’s lifelong development. The notion of collaboration between different teachers for projects of bilingual learning is highlighted in a separate section of the document (Partie IV). Further information and comments The instrument can serve as a valuable model for contexts of bilingual education / CLIL both in the area of the teachers’ necessary language competences, and further domains. REFDIC is a guide for designing, implementing and assessing teaching that focuses on intercomprehension as part of plurilingual education. Focus / content REFDIC is a list of teaching competences related to intercomprehension across 5 Latin languages which has three main dimensions: policy and ethics; communication and language; and education and teaching. Objective / format The list contains descriptors of the competences in question introduced by explanatory texts concerning the aims, the rationale and materials available. Institution / authorship Institutions participating in the EU MIRIADI project (https://www.miriadi.net/): Ana Isabel Andrade, Filomena Martins and Ana Sofia Pinho (Université d’Aveiro), in collaboration with Maddalena De Carlo (Università di Cassino e del Lazio Meridionale), and Mathilde Anquetil (Université de Macerata). ICT aspects: Maria José Loureiro (Université d’Aveiro). A useful Instrument covering various important competence areas relevant to pluralistic approaches. It demonstrates the usefulness of relating teacher competences to learner competences in the same domain, i.e. REFIC, the framework of communicative competences in intercomprehension. Examples of use in practice Miriadi, Prestazione 4.4 – Expérimentation des réalisations, rapport. Focus / content The instrument describes competences for introducing and conducting content and language-integrated learning (CLIL). Objective / structure The teacher competences are divided into two main sections: “Underpinning CLIL” and “Setting CLIL in motion”. The sections are subdivided into “areas of competence” (e.g. Second Language Acquisition), the respective competences (e.g. applying second language acquisition knowledge in the classroom), and “indicators of competence”, e.g. “can support students in navigating and learning new words, terms, idioms and discourse structures”. Target group CLIL educators and teachers. The framework describes a broad and useful variety of pedagogic competences, but also organizational competences, e.g. for the implementation of new curricula informed by CLIL. The “Australian Professional Standards for Teachers” is a generic national standard for school teachers’ initial training, professional development and career progression. Focus / content The “Australian Professional Standards for Teachers” is a generic national standard for school teachers’ initial training, professional development and career progression. Objective / structure Addresses the competences of all teachers, not only those concerned with languages. Covers professional knowledge, professional practice and professional engagement. Descriptors are organised in subsections of the above three categories and are structured across four professional career stages: ‘graduate’, ‘proficient’, ‘highly accomplished’ and ‘lead’. They are linked to 325 ‘illustrations of practice’ on video. Target group Teachers, school leaders, teacher educators, teacher organisations, professional associations and the public. Further information and comments • Much of its content is relevant to language teaching. • It is an outstanding example of a framework that is part of a whole programme for teachers. • It is linked to professional development and certification as well as to ‘illustrations of practice’ on video. It includes familiarisation activities, a self-assessment tool, and app. The InTASC (Interstate Teacher Assessment and Support Consortium) standards are an American competence framework for the initial education and lifelong development of teachers of all subjects in obligatory school. Focus / content The InTASC (Interstate Teacher Assessment and Support Consortium) standards are an American competence framework for the initial education and lifelong development of teachers of all subjects in obligatory school. Objective / structure The standards are organized in ten dimensions, which are assigned to four categories: the learner, learning environments, instructional practice, and professional responsibility. Within each dimension, a distinction is made between the teacher’s performances, the underlying essential knowledge, and the related critical dispositions. The 2013 version of the instrument contains progressions, i.e. three levels of increasing competence in the different standards. The progressions are accompanied by a description of typical professional learning opportunities for teachers to advance in these areas. A set of interrelated descriptors of values, professional knowledge and understanding, and ‘professional practice’. They standards are designed to aid the development of a qualification system for teachers and trainers working in adult lifelong learning. Focus / content A set of interrelated descriptors of values, professional knowledge and understanding, and ‘professional practice’. They standards are designed to aid the development of a qualification system for teachers and trainers working in adult lifelong learning. Further information and comments A rich list of descriptors aimed to provide a basis for qualification unrelated to means of acquiring the competences specified. The clear layout indicates how the values, knowledge and professional skills specified relate to one another. The General Profile of Professional Competences, the general framework for Portuguese teachers, gives a global overview about teacher competences. Focus / content The General Profile of Professional Competences, the general framework for Portuguese teachers, gives a global overview about teacher competences. Objective / structure The objectives concern mainly following aims: teacher’s development and professionalism, teaching and learning, methodology and assessment, learning resources and environments, attention to learners’ needs, research and evaluation, education for democratic values. The Profile is subdivided into 4 main dimensions: The professional, social and ethic dimension; Development of teaching and learning; Participation in school activities and links to the community; Long life professional development. This framework has a special focus on inclusive teaching in different contexts, and taking the learners’ repertoires in to account. The instrument can serve as a tool for reflection. It includes descriptors for education in general and research in education. The framework can be adapted to different contexts. Further information and comments The focus is on ethical and pedagogic principles common to all members of the education professions irrespective of subject area. The standards include competence in the language of schooling (French) and the ability to use another language as required by the job. The standards are followed by an interview with the then Director General of School Education on the training and development of the teachers of tomorrow. Objective / structure Following an introduction and a short glossary, each main section contains a list of general standards. There are eight such main standards under ‘teaching’, each of them subdivided. The’ personal and professional conduct’ section contains a shorter list covering ethical, safeguarding and legal issues etc. Further information and comments The main standards under ‘teaching’ cover motivating and challenging pupils, promoting good progress and outcomes, subject and curriculum knowledge, lesson planning, adapting to the strengths and needs of pupil, including those for whom English is a second language, good use of assessment, and behaviour management and safeguarding. The standards listed include a mixture of attitudes, knowledge and skills. Two of the standards from the General Teaching Council for Scotland’s Professional Standards, namely ‘Standard for Provisional Registration’ and ‘Standard for Full Registration’ (legal requirement for any teacher teaching in a Scottish state school). Focus / content Two of the standards from the General Teaching Council for Scotland’s Professional Standards, namely ‘Standard for Provisional Registration’ and ‘Standard for Full Registration’ (legal requirement for any teacher teaching in a Scottish state school). A framework to support the initial and continuing professional development of teachers in higher education. Focus / content A framework to support the initial and continuing professional development of teachers in higher education. Objective / structure The Framework has various objectives including to foster dynamic and creative approaches to teaching and learning through continuous development, and helping individuals and institutions to gain formal recognition for ‘quality-enhanced approaches to teaching and supporting learning’. It focuses on three interrelated aspects of teacher competence: ‘areas of activity’, ‘core knowledge’, and ‘professional values’. Target group Staff in UK higher education who are engaged in teaching and supporting learning in any subject or discipline. • Focuses on five areas of teacher activity: planning, teaching and supporting learning, assessment, providing support and guidance for students, and engaging in professional development and research. • Each area is subject to four common professional values and presupposes six common areas of ‘core knowledge’. • Descriptors are provided for four successive stages of Higher Education Academy recognition: Associate Fellow, Fellow, Senior Fellow, and Principal Fellow. • The descriptors are of professional practices, engagement and knowledge demonstrated by teachers, alongside which are typical individual roles and/or career stages. The framework describes language-related competences relevant for the initial education of teachers of all subjects. Focus / content The framework describes language-related competences relevant for the initial education of teachers of all subjects. Objective / structure The Basiskompetenzen are conceived as a modular curriculum for teachers of all subject, with strong emphasis on plurilingualism and interculturality, as well as language-sensitive subject teaching. There is a combined focus on the language of schooling as a second language, all languages present and learnt at school, and the language(s) in all subjects. The resource was written in the context of Austrian schools, and is based on the Austrian "Plurilingualism Curriculum" (Curriculum Mehrsprachigkeit; see link below), a framework for plurilingual learner competences. Further information and comments The competences, which predominantly refer to kinds of knowledge (e.g. about plurilingualism), are linked to suggestions for concrete activities within the context of a 2 semester, 6 ECTS module in Austrian teacher education. Further reading Reich, H.H., Krumm, H.-J. (2013) Sprachbildung und Mehrsprachigkeit. Ein Curriculum zur Wahrnehmung und Bewältigung sprachlicher Vielfalt im Unterricht. Münster: Waxmann. The EUCIM-TE curriculum describes teacher competences of the inclusive learning of academic language, with a focus on immigrant pupils learning the language of schooling as a second language. Focus / content The EUCIM-TE curriculum describes teacher competences for the inclusive learning of academic language, with a focus on immigrant pupils learning the language of schooling as a second language. Objective / structure The resources features descriptors for language-related competences (attitudes, values and skills) for teachers of all subjects with immigrant pupils in three areas: (1) language acquisition in the context of schooling, (2) methodology for inclusive academic language learning and teaching (IALT), and (3) school organization to facilitate inclusive academic language teaching. The framework describes language competences of teachers for certification in Canada, with a focus on the teachers’ different roles and the corresponding language functions. Focus / content The framework describes language competences of teachers for certification in Canada, with a focus on the teachers’ different roles and the corresponding language functions. Objective / structure The framework contains detailed language performance descriptors for three levels. It describes general competencies for writing, speaking, reading and listening, as well as “occupation-specific performance outcomes” and concrete examples of language use in different domains. For the latter, three main categories are distinguished: (1) managing the classroom and student behavior, (2) instructing and assessing, and (3) communicating with parents and professionals. Further information and comments The framework is based on a very thorough literature analysis, which is described in the first part of the instrument. Click below to find out more about these orientations, and to search for resources where they feature prominently. Covers didactic skills, including those related to planning, materials development, testing, and knowledge of, for example, language acquisition and learning psychology. The teacher’s language and cultural competence covers the teacher’s own ability to use the language(s) which, or in which, they are teaching, i.e. the target language(s) and/or the language(s) of schooling, and to work effectively as a teacher in the relevant cultural context(s). The teacher’s language and cultural awareness covers the teacher’s understanding of how language and communication work, enabling them to plan lessons, analyse language difficulties, deal with learners’ errors and questions etc. This also includes their general linguistic and cultural knowledge and awareness. View resources for "Language and cultural competence"
View resources for "language and cultural awareness"
The development of the teachers‘ language and cultural competence and awareness can be accompanied by more general educational aims: Development of a culture of democracy (human rights, social inclusion, democratic engagement) in teachers’ and students’ views, attitudes and educational pathways. Aimed at teachers teaching foreign languages (e.g. French or Chinese in the UK) or the language of schooling. For a specific contribution of language teaching to education in general: Development of a culture of democracy (human rights, social inclusion, democratic engagement) in teachers’ and students’ views, attitudes and educational pathways. A holistic plurilingual & pluricultural perspective covers competences related to setting aims and managing learning activities that develop learners’ - as well as the teacher’s - pluricultural and plurilingual competences. Capitalising on linguistic & cultural resources of the learner in the context covers competences needed for drawing on the diversity that students bring into the learning arena through their linguistic and cultural repertoires, and potentially the linguistic and cultural resources available in the location. View resources for "A holistic plurilingual & pluricultural perspective"
View resources for "Capitalising on linguistic & cultural resources"
Plurilingual and pluricultural development can be accompanied by more general educational aims: Development of a culture of democracy (human rights, social inclusion, democratic engagement) in teachers’ and students’ views, attitudes and educational pathways. Self-assessment by teachers of their own competence, attitudes, and reflection on their recent, future and long term development. Aimed at teachers concerned with the use of languages of schooling, including CLIL and the teaching of other subjects. Covers competences relevant to taking account of and responding to individual learning needs of different kinds (to do with a language of origin, literacy, disability, learning style, pace of progress etc.). Covers collegial and individual actions taken for professional, personal & institutional development, and any experiences and activities that are intended to, or do actually, contribute to the development of competences. Here you find brief descriptions of important resources that that outline (language) learners’ competences, and key background documents.